The soft sound of your baby snoring may strike you as adorable, but as a parent, you might begin to worry about what this means. In most cases, snoring in infancy is nothing to worry about, says pediatrician William Sears on parenting.com. Often, it's related to underdeveloped narrow airways congested with mucus, an issue which usually resolves as the airways grow. Sometimes, you may need to seek treatment for an underlying condition that is causing your baby's snoring. Consult your pediatrician if you're concerned that your baby's snoring is indicative of a larger problem. Apnea of prematurity is an issue specific to babies born prior to 34 weeks of pregnancy, Kids Health reports. Apnea is a sleep condition characterized by a brief disruption in breathing patterns that can include snoring. Due to their undeveloped respiratory systems, premature babies may have difficulty managing their breathing. If your baby has been diagnosed with apnea of prematurity, she will most likely be monitored at the hospital prior to going home for the first time. Apnea of Infancy is type of apnea that occurs in babies who are less than a year old. This diagnosis is made when all other types of apnea have been ruled out and no specific cause identified, Kids Health reports. Apnea of Infancy usually resolves on its own. You can monitor Apnea of Infancy at home through the use of special equipment prescribed by a sleep specialist. This equipment will measure your baby's heart rate and chest movements. It is possible that your baby's snoring is predictive of her likelihood of developing asthma. A study conducted at Cincinnati Children's Hospital Medical Center and cited on Medical News Today found that children with asthma were twice as likely to snore regularly than those without asthma. 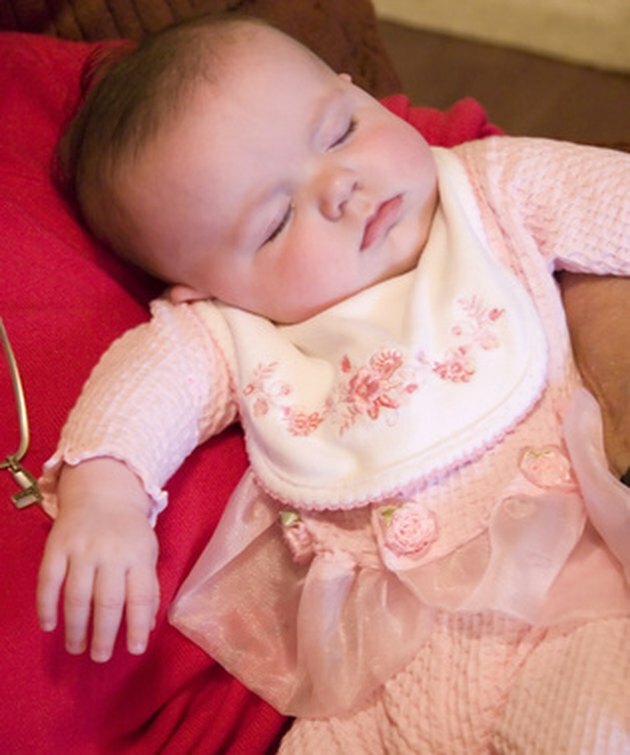 Babies whose parents snore are also more likely to snore, Medical News Today reports. Also known as obstructive apnea, enlarged tonsils or adenoids may block your baby's breathing passages during sleep when throat muscles are relaxed. In addition to snoring, symptoms of obstructive apnea might include gasping, labored breathing and fitful sleep, Kids Health reports. Why Does My Child Only Cough at Night?